It has been an interesting return to the workplace following a three year absence. As discussed in a previous post, navigation around my work area remains a challenge with narrow aisles, stray chairs, carts and discard bins. They always seem to migrate into the middle of the aisle making travel a challenge. Three hands would be most useful - one to hold work/supplies/items, one to push obstacles out of the way and the third to operate the joystick, powering the chair through the maze. Still my colleagues have been most patient and helpful. It has amazed me how quickly the 'rust' comes off with old routines remembered and new ones acquired. Mentally it feels great to be back. Physically, the only challenge is the injury related pain. Searing nerve pain continuously burns from the knees downwards and on occasion the sciatic nerve pain makes sitting difficult. Legs dangling to the floor without much movement seems to accentuate the pain. I stand up and stretch out periodically to relieve the pressure and increase circulation somewhat. Still, it isn't the same as if one was to walk around the room or head off to coffee. Difficult to ignore the pain but can put it in the back of my mind somewhat in order to concentrate on my work. It seems to me that the Lyrica does nothing for the pain at my current dosage of 50 mg tid. Core tightness remains a nuisance and with the continuous reaching, stretching, twisting and bending, the back muscles in particular, tend to get quite sore. I'm hoping that this eventually loosens up however at this time it almost seems as if the muscles rebel and try to tighten up even more in direct response to the stretching. My workplace has always had rather poor ventilation and I have inherited the hottest corner of the department. The heat frequently results in perspiration and a dry mouth. Because this is a microbiology lab dealing with infectious agents, eating & drinking are not permitted in the lab. I'm trying to find an appropriate balance of fluid intake as too little may lead to dehydration while drinking too much fluid would have me going through a somewhat tedious* decontamination ritual in order to leave the lab and travel to the nearest wheelchair accessible washroom outside of the department. Stand up and take off my lab coat - without scattering my scissors, forceps, pens, markers, ruler & post-it notes all over the floor, as has occasionally happened. 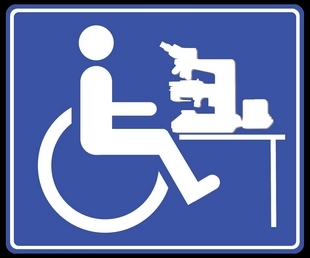 Replace the foot rests/supports as I wheel around the lab with the foot rests off and my feet raised. This allows me to get into tighter spaces, reach objects by standing up without having to toggle the supports out of the way, and allows me to spin in a tighter radius when turning around in the narrow aisles. Wipe down the wheelchair armrests, joystick controller and other parts that may have been exposed to possible contamination with a Virox (TM) antimicrobial wipe. Because of the harshness of the antimicrobial compound, non-latex gloves are recommended when handling the wipes. A step I tend to ignore. Travel to the dedicated hand washing sink, holding the joystick with the antimicrobial wipe so as to not recontaminate it, I then wash my hands for the recommended 15 seconds. Then it's down the hall, out of the department and into a fairly decent wheelchair accessible washroom. On my return, having washed my hands, I take off the leg rests once more and don my lab coat to resume work. So, I try to minimize my excursions out of the lab area. I have surveyed the hospital for all the wheelchair accessible washrooms as I know that sooner or later I'll encounter "my" washroom 'out of service' or occupied. Best to have a 'Plan B' before faced with a desperate situation.